Biodiverse Forage Mixtures: Can They Improve Animal and Pasture Productivity? 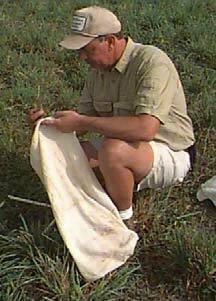 The role of plant species diversity or forage mixture complexity in pastures is not yet well characterized. Nonetheless, taking their cue from the plant diversity found in natural grassland communities, some producers in the Northeast often plant complex mixtures of grasses and legumes because they believe that maintaining a highly diverse botanical composition in pastures benefits plant persistence, yield stability, and pasture productivity. Most of the previous work on diversity effects on forage productivity has been in clipped experimental plots, with no actual grazing. Although clipped plots provide useful information that enables us to screen several treatments, little was known about the effects of forage mixture on animal productivity or the effect of animal grazing on botanical composition and productivity of complex pastures. Our research has shown that planting a mixture of grasses, legumes, and chicory benefits forage production during drought years and reduces weed invasion for a few years after planting. Producers may have to reestablish the chicory and legume components relatively frequently to maintain these benefits. We found that all pastures became dominated by orchardgrass after two years of intensive grazing. Pasture intake and grazing behavior (measured as grazing time, bites per minute, and grazing jaw movements) was not affected by botanical composition. This is surprising in view of previous literature describing grazing behavior. One possible explanation is that these lactating animals had a high intake drive, which may have made them less selective, particularly at the beginning of the grazing session. More research is needed (and is ongoing at our location) at the animal-plant level to better understand this complex relationship when animals make dietary choices, and how we can either work with or influence those choices through feeding management (i.e. grazing management, supplementation, pasture seeding, and whole-system management). Milk production per acre was similar for the more complex forage mixtures and was 86% higher for these mixtures than for the simple orchardgrass-white clover mixture during a drought year, and 34% higher during a wetter year. These differences in milk production per acre were due to differences in stocking densities rather than from daily milk production per cow, which was similar for all forage mixtures. Forage mixture did not affect pasture dry matter intake (DMI). Milk conjugated linoleic acid (CLA) content was 188% higher than pre-trial levels (when cows were fed a total mixed ration in confinement). Cows grazing forage mixtures with chicory (3-, 6- and 9- species treatments below) had 17% higher CLA content than cows grazing a simple 2-species orchardgrass-white clover mixture. 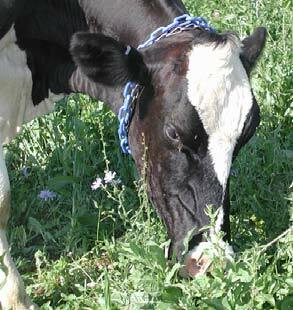 Managing for a moderately complex (3 to 5 forage species) mixture of forages on pasture may result in greater carrying capacity of the pastures due to increased forage productivity and reduced weed competition, while maintaining animal productivity. Cows were able to select a high quality diet on any of the forage mixtures. Therefore, maintaining a vegetative dense pasture is key, regardless of species composition, to providing high-producing dairy cows with enough high-quality forage to maintain high levels of milk production and maintain or improve pasture productivity. We do not yet have a good handle on diet selection by dairy cows grazing different forage mixtures. A better understanding of the interaction between grazed plant and grazing animal is needed to predict preference, intake, and productivity of grazing cows. Current research at our location focuses on structural and physical attributes of various forage species that affect grazing behavior such as bite mass (how much dry matter a cow consumes with each bite), grazing jaw movements, and bite rate (how fast they take bites). We will continue this research by using a combination of highly controlled small experimental boxes (pictured at right) and pasture-scale research to evaluate grazing patterns as well as productivity.